Inky Paws Challenge: Inky Paws Challenge #33 Winners! Inky Paws Challenge #33 Winners! Thanks so much to everyone who entered our last Inky Paws Challenge at here at the Newton's Nook Designs blog! This months Challenge was to use Ombré on your project! Here are our top picks! Read the description below each card to see who created it - and make sure to visit their blogs and tell them congrats!! Our first top pick is this clean and simple Paris card by Tonya! She used the images from our Newton Dreams of Paris stamp set and created an awesome pink ombré background! 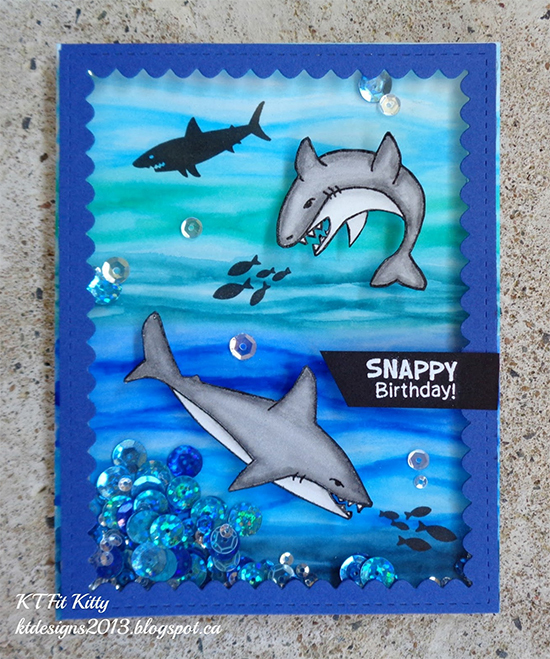 Our second top pick is this gorgeous Shark shaker card by KT Fit Kitty! We loved the ombré water scene she created for those sharks from our Shark Bites stamp set! Congrats to Tonya and KT Fit Kitty! Don't forget to send us an e-mail at info@newtonsnookdesigns.com to claim your $10 store credit! We also wanted to share a couple more entries that we really loved! We chose THREE more as our favorite picks! If you see your card below, contact us if you'd like to get a "favorite" badge for your blog! 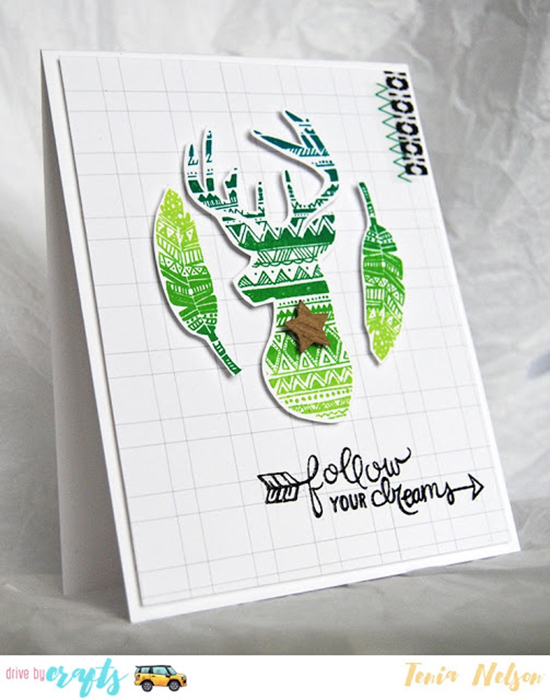 We loved the bold modern look on this deer card by Tenia! The green ombré on the deer and feather from the Adventure Awaits stamp set are so fun! We loved the fun ombré background Dawn created with markers and vellum on this card! She used the kitty on the stack of blankets from our Newton's Naptime Stamp set. 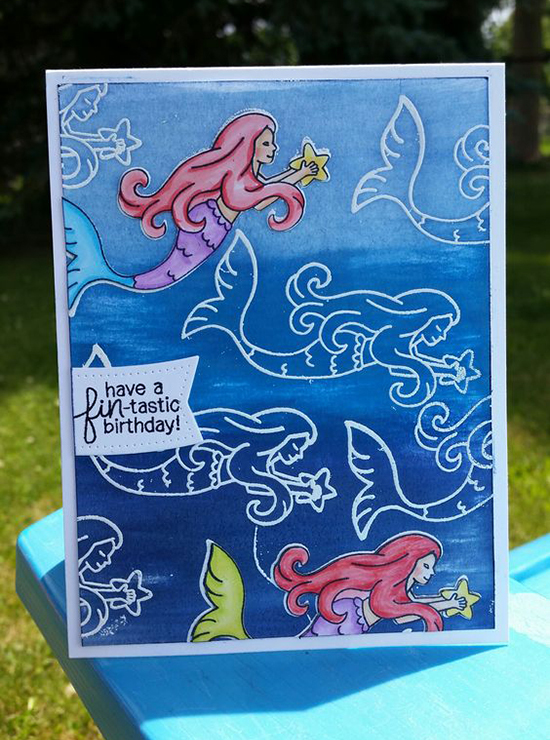 This mermaid card by Sally Ann is super fun! We love the white embossing and the ombre´water. Check out her pinterest board for several more cool mermaid and ombré cards using our Mermaid Crossing Stamp set! Thanks again to everyone who entered - It's really so much fun to look through all the entries and see everyones ideas! If you didn't win this time we hope you'll play along again next time! 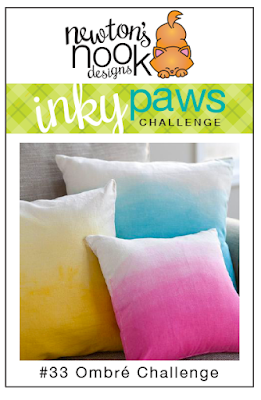 Our next Inky Paws challenge will begin in a couple weeks - on Friday, July 22nd!